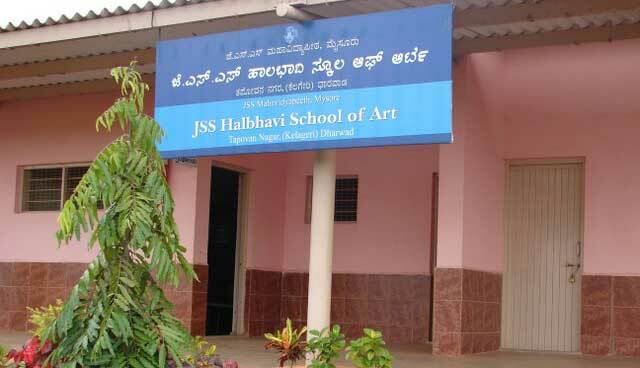 JSS Halbhavi School of Art, a first of its kind in Karnataka, was established way back in 1935. Late D.V. Halbhavi, a great visionary and an educationist, started this school with an aim of providing education in fine arts. Hundreds of students have graduated from this school since then. D.V. Halbhavi was a student of the famous J.J. School of Art, Mumbai. 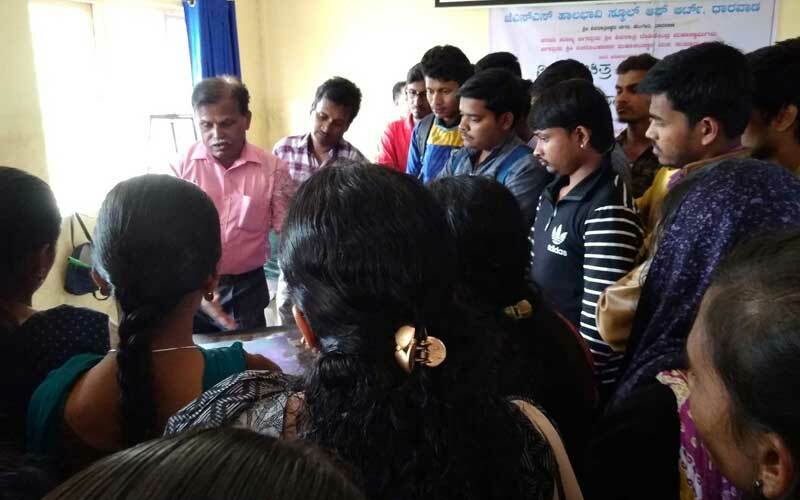 The atmosphere of J.J. School of Arts prompted Halbhavi to establish an art school in Dharwad, with encouragement from his father Shri Veerabhadrappa Halbhavi. The ancestors of Shri D.V. Halbhavi belong to the Heralagi family, which hailed from Gote Village, in Bijapur District. The Heralagi family is known for its contribution to the Fresco Painting during the Adilshahi period. The school was established in 1935, under the Fine Arts Society, Dharwad. In the beginning, the classes were held at the R.L.S. High School building. From 1936 to 1939, the classes were being held at the Karnataka Vidhyavardhak Sangh, a building which has a historical significance. In 1940, D.V. Halbhavi decided to construct an own building for the school. The building came upon Poona-Bengaluru Highway and soon became a landmark, as it was located in a central place. Art classes were conducted here regularly. Besides art classes, music and dance classes were also held in the evenings. The school was equipped with a good library; and foreign magazines were the main attraction for the elite class of Dharwad, who used to visit the school in the evenings. D.V. Halbhavi was very fond of literature. So, eminent literateurs like Jnanapeetha Awardees Da.Ra. Bendre, Kuvempu, Senior Journalist Patil Puttappa, Chennaveera Kanavi, N.K. Kulkarni, Panchakshari Hiremath and others used to visit the School. Dr. D.C. Pawate, the founder of Karnatak University, Dharwad, and an eminent educationist, was also very close to D.V. Halbhavi. Since Shri Halbhavi was a good singer himself, he used to invite famous singers like Dr. Gangubai Hangal, Pandit Shri Mallikarjun Mansur and Shri Hukkeri Balappa, to his School. Eminent artists like K. Hebbar, A.A. Almelkar, M.R. Acharkar [Art Director for Rajkapoor Films], G.S. Dandvatimath, J.S. Khanderao, V.K. Patil, B.C. Malgatti, R.B. Kumbar, K.B. Kulkarni and many others were very close to D.V. Halbhavi, and all of them used to visit the school regularly. 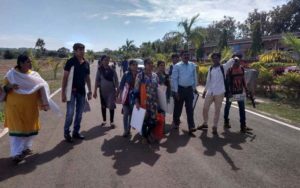 Most of the students who came seeking education here were poor. But D.V. Halbhavi welcomed both the rich and the poor impartially. He provided accommodation for the poor students in the school itself. Though the school was facing a financial crunch, Halbhavi never got discouraged. During those days it was very difficult to get maintenance and salary grants. However, his strong desire and commitment kept the school alive. The students who have learned here have earned a good reputation at national and international levels. The list includes Late Somashekar Sali, Bagalkot, Ex-President of the Karnataka Lalit Kala Academy, Shri M.B. Patil, K.Venkatappa Awardist Shri R.G. Raikar, Senior Artist Shri Suresh Heblikar, Director and film actor, Shri Anil Thakkar, Director, B.K. Hubli, Shri Ishwar Murgod, Shri Bhimrao Murgod, Delhi, Late Shri Kalidar Pattar, Late Shri Shankar Patil and many more. D.V. Halbhavi also had a flair for languages and writing. His book ‘My Contemporary Artists’ is in English. Interestingly it contains some coloured pictures. His travelogue titled “Visit to Ceylon” is also beautifully written. He used to edit “Art Guild”, a monthly art magazine. This course consists of one years’ foundation in Visual Art.. Candidates who have passed ( Old) first year foundation in Visual Art can seek admission to second year. SI No. Subject Code No. All practical subjects are compulsory. Candidates can choose any two languages. A. Candidates who have completed one year Foundation Course in Visual Arts, recognized by any University or DMC course, which is equivalent, are eligible to take admission to BVA First year. Candidates who have completed First year BVA/BFA in painting, which is recognized by any University and equivalent are eligible. Candidates those who have failed in four subjects of BVA First year are eligible for BVA Second year. Candidates who have passed second year BVA/BFA from any recognized University are eligible for admission to BVA third year. Candidates who have completed Art Masters Diploma or Diploma in Painting are eligible to take admission to BVA Third year (Bridge Course). Medium of Instruction is only in Kannada. However, examination papers can be written in other languages by mentioning it in the Examination Form. Exemption of languages for deaf and dumb candidates. Instead of languages practical subjects will be taught to them. For any class, admission is valid for only one year. Interested candidates who seek admission for next class should fill in fresh application. Photocopy of marks card of PUC /Equivalent Exam. 2. Photocopy of provisional marks card of PUC/Equivalent Exam. 5. 6 copies of passport sized photographs (self) to be enclosed in a separate envelope. 6. Migration Certificate, if the candidate is from other state (if necessary). Photocopy of marks card of SSLC/Equivalent Exam. 2. Original Transfer Certificates and Two photocopies (if necessary). 3. Photocopy of Caste/Income Certificates (if necessary). 4. Photocopy of Marks Card of Art Foundation Second Year/DMC. Photocopy of marks card of SSLC / Equivalent Exam. 4. Photocopy of Marks Card of BVA / BFA I year Exam. Admission is temporary. In case the candidate is found violating discipline in college his/her admission will be cancelled. 2. Fees once paid are not refundable. Candidates who are desirous of taking scholarships have to fill the prescribed forms according to the information by the institution. SC and ST candidates are expected to give the original and photocopies of caste certificates. Student’s Scholarship from Karnataka Lalit Kala Academy. Award instituted in the name of Dr. M.V. Minajigi– for student who has scored highest marks in Diploma/BVA. Dr. Parvati Halbhavi Award – (instituted in the name of Late Tara Pawar, ex – principal of JSS Halbhavi School of Art). Prof. Kiran Shinde Award– for Meritorious Boy Student of the year. There are separate classrooms for L.K.G and U.K.G students, along with proper seating arrangements, which are neatly maintained. The school also has a big playground, where they can play all kinds of games and sports, under the guidance of the teacher concerned. Separate toilets for both boys and girls, and pure drinking water facilities are provided. Cultural activities are conducted throughout the year. Children are encouraged to participate in cultural activities like singing rhymes and songs, etc. Children will be trained by teachers to participate in all activities. Important national festivals observed in the school: Independence Day, Teachers’ Day, Gandhi Jayanthi, Children’s Day and Republic Day. Students are encouraged to prepare simple charts and models, under the guidance of the teachers. The charts and models will be displayed during the Science and Arts Exhibition held in the school. Organized by Kannada University, Hampi. 2002 – First Class in B.F.A. (Painting), Govt. College of Fine Arts, Dharwad. 2007 – Distinction in M.phil (Painting) Kannada University Hampi. 2013 – Excellent in PhD in “Paintings of Veerashaiva Tradition in Karnataka” Kannada University, Hampi. Art Master Diploma at Halbhavi School of Dharwad. Diploma in Drawing and Painting at KEN School of Art, Bangalore. 1990 A.M at Govt. College of Fine Art Dharwad. 1992 G.D at Govt. College of Fine Art Dharwad. 2001 B.F.A Govt. College of Fine Art Dharwad. BFA – Karnatak University, Dharwad.